Craig Pittman joined the United States Marine Corps upon graduating and achieved the rank of sergeant..
April 20, 1995 – VTJ Vale Tudo Japan: Craig “Pitbull” Pittman fought at the Japan Vale Tudo 95 tournament..
~~~~~~~~~~~~~~~~~~~~~~~~~~~~~~He won his first fight against Wayne Emons by a Choke submission..
~~~~~~~~~~~~~~~~~~~~~~~~~~~~~~He lost his second fight to Yuki Nakai by an Armbar submission..
May 21, 1995 – WCW: Slamboree Main Event: Craig Pittman defeated Mark Starr by Submission..
June 18, 1995 – WCW: Great American Bash Main Event: Sgt. Craig “Pitbull” Pittman defeated Chris Kanyon by Submission..
June 18, 1995 – WCW: Great American Bash: “Hacksaw” Jim Duggan defeated Craig “Pitbull” Pittman by DQ..
September 17, 1995 – WCW: Fall Brawl: Sgt. Craig “Pitbull” Pittman defeated Cobra (Jeff Farmer) by Submission..
Septmeber 25, 1995 – WCW: Nitro – Kurasawa defeated Sgt. Craig “Pitbull” Pittman..
October 29, 1995 – WCW: Haloween Havok Main Event: Sgt. Craig “Pitbull” Pittman defeated VK Wallstreet..
October 30, 1995 – WCW: Nitro: – Eddie Guerrero defeated Sgt. 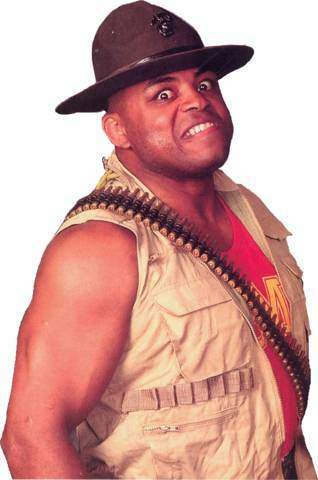 Craig “Pitbull” Pittman..
November 26, 1995 – WCW: World War III: Sgt. Craig “Pitbull” Pittman participated in a 60-man, 3-ring Battle Royal..
~~~He was the 42nd person elliminated, and was thrown out by Hugh Morrus..
February 11, 1996 – WCW: superbrawl VI Main Event: Big Bubba Rodgers & VK Wallstreet defeated Joey Maggs & Craig Pittman..
May 19, 1996 – WCW: Slamboree: – Rick Steiner & The Booty Man defeated Scott Steiner & Sgt. Craig “Pitbull” Pittman..
May 27, 1996 – WCW: Nitro: – Diamond Dallas Page defeated Sgt. Craig “Pitbull” Pittman..
June 3, 1996 – WCW: Nitro – Sgt. Craig “Pitbull” Pittman defeated Disco Inferno..
July 8, 1996 – WCW: Nitro: – Chris Benoit defeated Sgt. Craig “Pitbull” Pittman by Submission..
August 05, 1996 – WCW: Nitro: – The Giant defeated Sgt. Craig “Pitbull” Pittman to retain the World title..
September 9th, 1996 – WCW: Nitro: – Scott Norton defeated Sgt. Craig “Pitbull” Pittman..
October 21, 1996 – WCW: Nitro: – Diamond Dallas Page defeated Sgt. Craig “Pitbull” Pittman..
December 09, 1996 – WCW: Nitro: – Arn Anderson defeated Sgt. Craig “Pitbull” Pittman..
January 13, 1997 – WCW: Nitro: – Chris Jericho defeated Sgt. Craig “Pitbull” Pittman..
March 10, 1997 – WCW: Nitro: – Diamond Dallas Page defeated Sgt. Craig “Pitbull” Pittman..
July 7, 1997 – WCW: Worldwide: Glacier defeated Sgt. Craig “Pitbull” Pittman with the Cryonic kick..
July 10, 1998 – NWA: All Star Wrestling: Dan “The Beast” Severn defeated Sgt. Craig “Pitbull” Pittman..
After a lenthy military-style feud with Cobra, Craig Pittman turned babyfaced and hired Teddy Long as his manager..